I keep losing subscribers, and I don't know if it is because my writing is getting worse (or more offensive), or if it is just that the economy is getting worse. If it's due to my "content", I want to know so I can try to do better. If subscribers are the canary in the mineshaft, I need to be paying attention to them. I do know I have angered a lot of people with my honest assessment of armed government bullies of every sort-- I've seen those comments about me crop up on other blogs around the internet from time to time. If it's due to the economy, I'm not sure what I could do other than to inspire people through my words to the point they feel compelled to subscribe in spite of the economic problems. And that just goes back to questioning whether my writing is declining in quality or relevance. It may also be that most people interested in liberty are usually broke-- which does seem to be the case, in general. Anyway, if you are a former subscriber who would like to weigh in, please email me privately. I promise I won't criticize your reasons for ending the subscription, whatever they may be, nor will I beg you to resubscribe. I simply want some data here. While your assessments of the State, in its various current and historical forms, are correct, there is a feeling that Anarchy is not a viable alternative. Anarchy seems to be a transitive condition between the collapse of one State and the establishment of another. Anarchy can only exist until an individual or group discovers that others are incapable of quickly organizing resistance to coercion and violence, and that coercion and violence can be used to increase their power and wealth - the birth of the State. We need a new kind of social structure, an Anti-State. What would the characteristics of an Anti-State be? "...others are incapable of quickly organizing resistance to coercion and violence..."
You just assume this. Do you really think that in order for people to be able to defend themselves from aggression they must be ruled over (which uses aggression)? Aggressors will pack up to prey upon individuals. 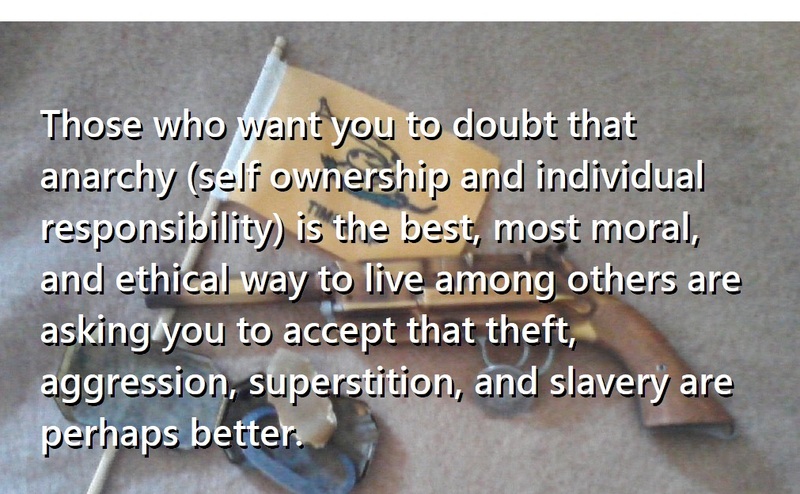 Aggressors are motivated by self-interest, but are not constrained by the non-aggression principle or a shared morality. They believe in power and they will organize themselves to gain an advantage to obtain more of it. This is not a simple assumption. It is an observation based upon historical precedent. Aggressors will tribe up to dominate other tribes. Some tribes will align and merge with the stronger tribe for survival and to get a part of the spoils. This eventually leads to the development of the State. An anti-state would be an autarchist state, with a very small set of laws created at its founding set about the NAP, negative rights, property rights, and contract rights and responsibilities. Periodic referendums would be held on public projects, which would establish public corporations tasked with executing the output of those referendums. Taxes would be eliminated, and public works would be paid for only by tolls and rents for voluntary usage. 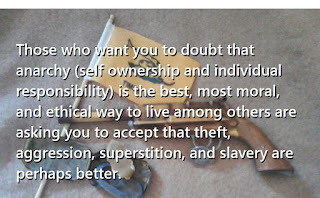 Law enforcement would be the responsibility of all, and punishment would be done through loss of reputation, not incarceration. We cannot have a State, but it tends to happen anyway. We need something to fill that void to prevent it from occurring. problem is well described. solution is the Firefly class spaceship to get away on. like minded folks should get to work. establish public corporations tasked with that.